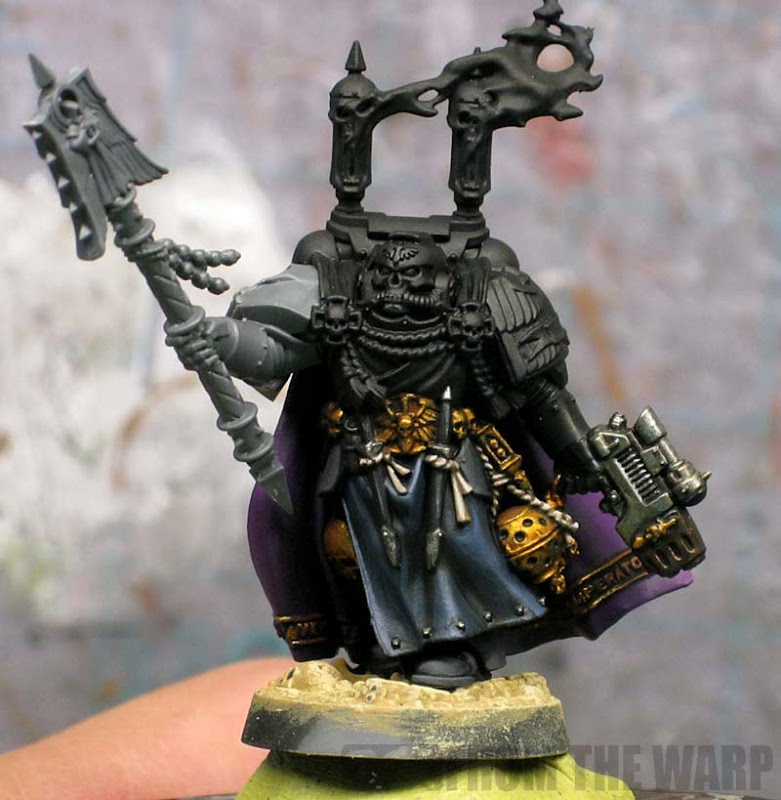 I recent got the chance to paint up the Limited Edition Chaplain that comes with the super special boxed set. I've actually got the Librarian to paint as well, but I figured I'd share some pics of the Chaplain now that I have him painted up. He's been painted to a pretty basic level to match the existing army he's going to be a part of. He's another model for a friend of mine and his huge DIY Space Marine Chapter. This model was a blast to paint with all of the detail on him. I was a bit worried at first about how I was going to get into the tight areas, but found myself leaving the arms off until I painted the inside of the cloak and then gluing them in place. I don't do much work using a sub-assembly approach and it can throw me off my game sometimes. I didn't do anything fancy with this guy. There is no conversion work or modifications. Just a simple paint job. The one thing that did catch me off guard was the smoke coming from his backpack. At first, I wasn't sure how I was going to paint it so that it read as smoke and not some kind of nondescript blob. I ended up painting it black and then dabbing a dark grey followed by a slightly lighter grey over the prominent protrusions. That created a mottled look I hoped I could pass off as "smoke." Over that went a heavy wash of Nuln Oil and Agrax Earthshade which worked perfectly in pulling it all together. When it came to painting the robes, I knew I had to use purple since that was one of the main colors in the army. 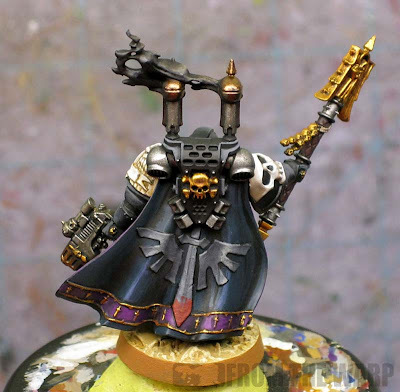 I wanted to keep the model somewhat dark since he's a Chaplain as well. That's when I figured I would highlight his armour a basic grey color and use P3 Coal Black for the other side of his robes to give it a dark blue look. I think it contrasts nicely against the purple and does well as another dark element on the model at the same time. My friend doesn't usually run a Chaplain in his force, but this should give a decent model to use when he does decide to try one out. I agree, I love the purple. Very nicely done. The black part of the robes look fantastic. You've managed to make black look very rich. Nice work on the model. I had the chance to paint this up recently, but went closer to the original colorings with it. Will have to post it up one of these days. After seeing yours though, I want to get a second one now, and do it more custom color.. has a lot of potential this model! That really turned out well - great work, Ron! Hive Angel: I go back an forth sometimes. I like the glow effect, but when I leave it off, it doesn't draw attention to the weapon. Sometimes I fear it's an overused effect and something we "just do." Zab: They are gorgeous models and I can see how it would take soem time to change the iconography. Good luck! M R Lee: Since this one was for my friend and needed to match his army, I couldn't paint it in the classic scheme. IT is a fun model to paint though. Looks amazing, as always, Ron! This is great Ron! Well done. Even though he's done to a "basic level" I think you've pulled it off really well. It gives me some ideas as to how to do his armor from the pictures - I still have mine to do. Its hard balancing so many projects with my Angels Encarmine slowly plugging along and adding these Dark Angel allies. Speaking of my angels encarmine, I think I'm making some good progress and will be posting a blog soon about them. Thanks! Any chance of a better pic of the Crozius Arcanum? 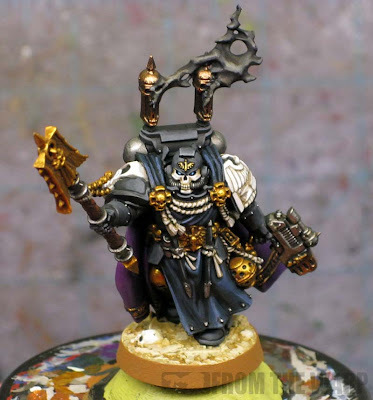 The blacks on this model look amazing. Can you run down the colours used on the cloak/tabard as they look almost perfect for the colours I need for my Minas Tirith models. Did I mention that you are really my favourite miniature painter? Here's why: Your models really have a "unity of effect" thing going on. While there may be painters who can pull of even more amazing stunts, detailing etc., your models always look completely realised: All of the different colours and effects work together to create a model that looks like a little slice of that particular universe. Nothing detracts from the overall effect. They look like they were meant to be that way. I cannot, for the life of me, think of a more successful way of painting! Aaron Harris: Thanks, looking forward to seeing your progress. neverness: Sure, let me snap a couple pics and I'll go over the method I used to paint the gold as well. Segmentum Obscurus Studios: Absolutely. The bloack is your basic primer and basecoat. The first layer is P3 Coal Black that I blend into the black. And it's not really blend... I try to but I don't worry too much about it since the P3 color is very dark to begin with. Over that goes the final spot/edge highlight of GW Base color The Fang. Krautscientist: You are too kind. I'm just sharing what I'm learning as I figure out how to paint models. The moke seems to cause a lot of consternation among painters. Do you think it would be possible to use a material to do it rather than paint eg cover in dyed cotton wool etc? rob82: Moke? what is that? Ahhh! I meant smoke. Sorry I obviously can't think and type. Your smoke looks very good and sounds simple to do but trying to capture something ethereal like smoke in plastic and paint sounds nigh on impossible. So I was wondering if you had a free reign how you would try and do it. My initial thought is to use something 'whispy' like cotton wool and colour that. What do you think? Ahhh... got it. I'm not a big fan of things like smoke, but it was on the model in this case. If I had my own choice, I would have left it off the model entirely. I like the idea of using cotton and such when it comes to destroyed vehicles and such, but that's where it ends for me. It's really interesting to see you develop your blacks further, even though you said that you had settled on zenithal edge highlighting the last time you tried to figure out how to best paint black... Your smooth transition on the armour is amazing! Kai: Thanks! I like the sharp edge highlights, but gave this guy a blended look to match the other blended guys in the force. On my own models, I have a tendency to do both. I use the blended highlights over the large areas and then hit a few prominent edges with a sharp line highlight for effect. It's the best of both worlds for me. 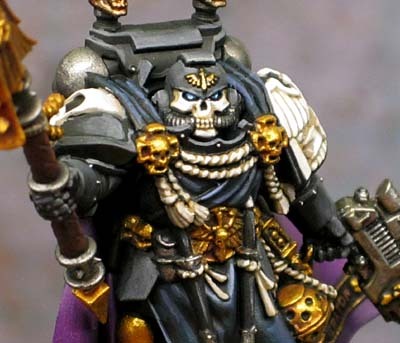 Ron - I like this Chaplain a lot. It is a great example of a nice, clean paint job whose apparent simplicity belies its well thought out color scheme and skillful application. In particular, I enjoy how you used grey for the armor highlights and blue for the cloth highlights to separate the two. As usual, that is some great eye-candy! Thanks. I'd like to say it was all planned out, but I was just keeping in line with the rest of the army scheme. It was just a matter of juggling the few colors I did have to work with. Amazing paint job. I'm surprised your friend didn't want all the DA iconography removed though for a DIY chapter. His DIY chapter has similar iconography so it's very easy to use DA bits in his force with very little to no modification. Otherwise I would have had my work cut out for me. This looks fantastic! I've just recently been stepping up my painting skills and I hope by the time i get to my chaplain that I can do half as nice as this.